When you check in, the hotel will place a hold on your credit card for the full cost of the hotel stay plus $150 per day, almost $2200 for a 6-night stay. If that's a problem, they will accept a $150 cash deposit that they will refund at the end of the stay, but they won't let you charge things to the room. Note: Most hotels do this, though $150 is unusually high. If you use a debit card, the hold will actually be on your account, not just your credit limit! The rooms all have small refrigerators, so you can keep breakfast, etc. in your room. If you want to spend a few days in Puerto Rico before or after the meeting, there are a plenty of nice places to stay for about $100-$130 per night (plus tax). 11% "resort fee". Some places on the web site still say 14%, but 11% is the negotiated rate and we are assured that you will see this rate at checkout. 11% local hotel occupancy tax. Tax rates are always subject to change, but we don't forsee that this will. one-time $10 portage service charge. There is an additional charge for three or more occupants. Cancellations must be made at least three days in advance for full refund. Reservations will open Tuesday, 15 September 2009. Rooms are available for the nights of Friday, 9 October and Saturday 10 October 2009. Please call 1-800-625-0312 or 787-625-9025 to make your reservation. You may also send an email to reservations@hisanjuan.com. 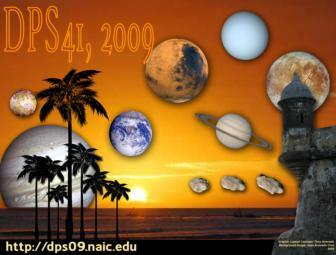 Please reference the reservation code as DPS/American Astronomical Society to make sure you receive the correct rate. A shuttle will be available from the El Conquistador to the Holiday Inn following the final scientific sessions on Friday afternoon. The AAS has organized a roommate search bulletin board. You will need to register on their site to use it. You do not need and AAS membership number to do so: just leave that field as-is and it should work. When you load that site, find the "register" button, and follow the instructions. It will send a confirming email with a web link that you need to enter, at which point you can post to and read messages on the board. It all takes about 2 minutes.